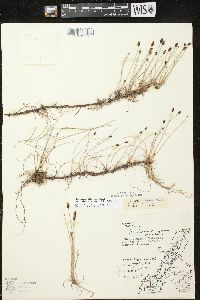 Plants perennial, mat-forming; rhizomes evident, fairly long to long, 0.5-2.5 mm thick, hard, cortex persistent, longer internodes 2-10 mm, scales persistent, sometimes decaying to coarse fibers, 5-10 mm, membranous to papery. Culms subterete to sometimes compressed, to (2-)3 times as wide as thick, often with (4-)5-10 ridges or angles, 5-90 cm × 0.3-0.8 mm, firm to soft, spongy. Leaves: distal leaf sheaths persistent, not splitting, proximally dark red, distally green to stramineous or red, thinly papery to membranous, apex usually red-brown, obtuse to subacute, often callose, tooth to 0.5 mm usually present on some culms. Spikelets ovoid, 3-8 × 2-3(-4) mm, apex obtuse (to acute); proximal scales amplexicaulous, apex entire; subproximal scale with a flower; floral scales spreading in fruit, 10-30, 5-7 per mm of rachilla, medium to very dark brown, midrib region often paler, ovate, 1.7-3 × 1-1.5 mm, apex rounded to obtuse (or acute), entire or shallowly notched (emarginate) or sometimes cut to 0.5(-0.7) mm deep, apical colorless hyaline part at least as wide as long, 0.2-0.7 mm, carinate in distal part of spikelet. 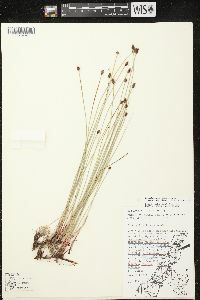 Flowers: perianth bristles absent or rarely 1-3, pale brown, to 1/2 of achene length, sparsely retrorsely spinulose; stamens 3; anthers orange-brown, 0.8-1.7 mm; styles 3-fid or some 2-fid. 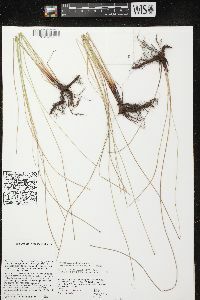 Achenes persistent after scales fall, usually lemon yellow or dark yellow, orange, or medium brown, rarely greenish, obpyriform, nearly equilaterally to compressed-trigonous, often some biconvex, angles evident to prominent, 0.7-1.2 × 0.6-0.9 mm, neck short or absent, finely to coarsely rugulose at 10X, 12-20 horizontal ridges in vertical series, usually finely cancellate at 10-20X. Tubercles brown to whitish, greatly depressed, apiculate, sometimes pyramidal, 0.1-0.25 × 0.25-0.45 mm. 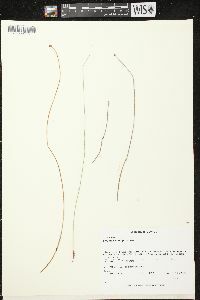 2n = 38. Fruiting late spring-summer. Very wet, calcareous (or brackish) shores, pool margins, fens, meadows, prairies; 0-1000 m; Alta., B.C., Man., Nfld. and Labr., N.W.T., N.S., Ont., Que., Sask. 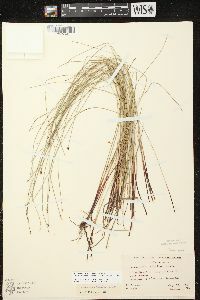 ; Conn., Idaho, Ill., Ind., Iowa, Maine, Mass., Mich., Minn., Mont., N.H., N.J., N.Y., N.Dak., Pa., Tenn., Vt., W.Va., Wis. Eleocharis elliptica is very variable in rhizome thickness, internode length, culm thickness and cross section shape, presence of a tooth on the distal leaf sheath, floral scale shape, stigma number, and achene color, cross section shape, and surface sculpturing. 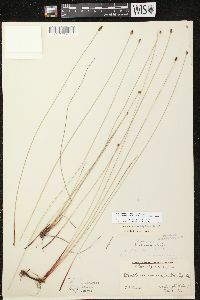 It is difficult to separate E. elliptica from E. tenuis and E. compressa. Three varieties have been recognized: (1) E. elliptica var. 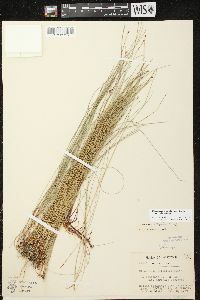 elliptica, characterized by rhizomes 0.5-1.5 mm thick with the longer internodes 2.5-10 mm, culms terete to subterete, and floral scales entire to shallowly emarginate; (2) E. elliptica var. atrata (Svenson) S. G. Smith, characterized by rhizomes 1.5-2.5 mm thick with the longer internodes very crowded to 5 mm, culms often compressed, to 2 times wider than thick, and floral scales mostly emarginate or deeply cut; 3) E. elliptica var. 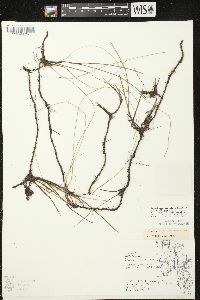 pseudoptera (Svenson) L. J. Harms, herein placed in E. tenuis. Varieties of Eleocharis elliptica are not formally recognized herein because they intergrade greatly. 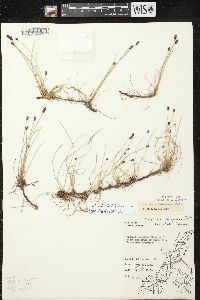 Eleocharis elliptica var. atrata is intermediate between E. elliptica var. 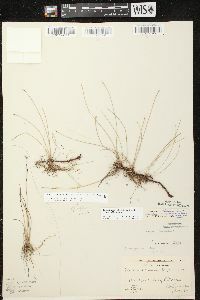 elliptica and E. compressa var. compressa; it has usually been placed in E. compressa but is better placed in E. elliptica because the type of var. atrata is more like E. elliptica (S. G. Smith 2001). 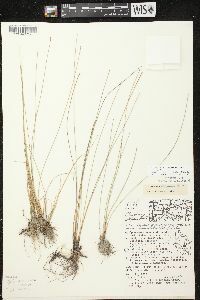 Eleocharis tenuis var. 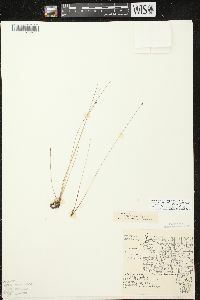 pseudoptera Svenson might also be treated as E. elliptica var. 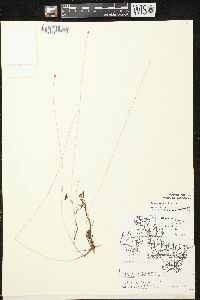 pseudoptera following L. J. Harms (1972), who also reported that he produced fertile E. compressa × E. elliptica hybrids. 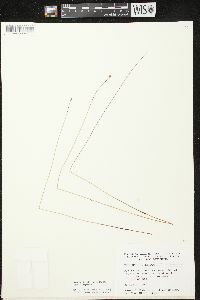 I have not seen voucher specimens for any of the chromosome numbers or hybrids that Harms reported for any of the species and varieties discussed above. My field observations in calcareous fens in Wisconsin suggest that E. elliptica var. elliptica is adapted to microhabitats where the surface soil is permanently saturated by groundwater discharge; E. compressa var. compressa is adapted to microhabitats such as depressions in prairies and exposed limestone that are dry in summer; E. elliptica var. atrata is adapted to microhabitats that are intermediate between those of typical E. elliptica and those of E. compressa (S. G. Smith 2001). 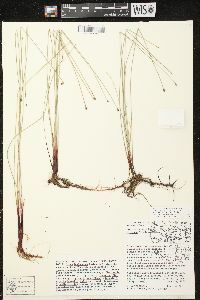 Perennial herb with long rhizomes, mat-forming 5 cm - 1 m tall Leaves: reduced to bladeless sheaths, basal, two per culm, margins fused and enclosing culm, not splitting, dark red basally, reddish brown at the apex, papery to membranous, with a blunt to nearly pointed apex that often bears a tiny tooth. Flowers: minute, spirally arranged on the axis of the spikelet, lacking sepals and petals, with zero or rarely one to three bristles, subtended by a scale. 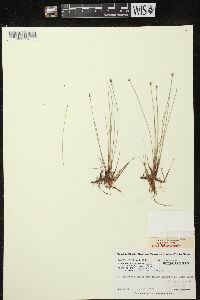 Bristles (when present) pale brown, to half the length of the achene. Stamens three, exserted. Anthers orangish brown, to 1.7 mm long. Pistil one. Style three-cleft, or some two-cleft. Fruit: a one-seeded achene, persistent after scales have fallen, yellow to dark yellow, orange, brown, sometimes greenish, about 1 mm long, 0.6 - 0.9 mm wide, reverse pear-shaped, three-angled (nearly equilaterally to compressed), some convex on both sides, finely to coarsely wrinkled (at 10X), with 12 to 20 horizontal ridges in each vertical group. Tubercle whitish to brown, tiny, very depressed, pointed, sometimes pyramidal. Seed with a thin, non-adherent wall. 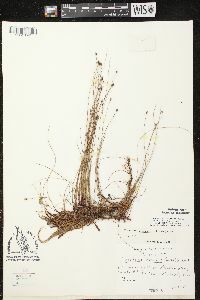 Culm: unbranched, 5 cm - 1 m long, about 0.5 mm wide, nearly circular in cross-section or sometimes compressed to three times as wide as thick, five- to ten-ridged, spongy, enclosed basally by two fused sheaths. 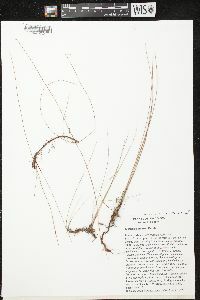 Spikelets: solitary, 3 - 8 mm long, 2 - 3 mm wide, egg-shaped with a blunt to pointed apex, with ten to thirty floral scales. Scales spirally arranged and overlapping, brown to dark brown with a paler midrib, hyaline towards the apex, 1.5 - 3 mm long, 1 - 1.5 mm wide, egg-shaped with a blunt, rounded, or pointed apex, or sometimes notched or cut. Habitat and ecology: Interdunal panes, marl flats, and calcareous fens. 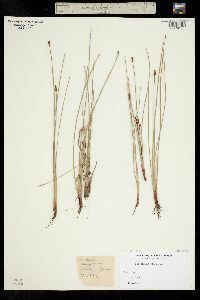 Etymology: Eleocharis comes from the Greek words heleios, meaning "dwelling in a marsh," and charis, meaning grace. Elliptica means elliptical. 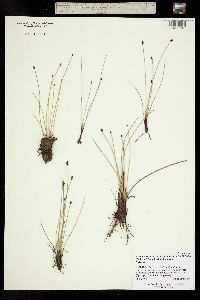 This sedge seems to have a wide distribution in the state. In the lake area it is found in strongly marl borders of lakes and elsewhere in moist prairie habitats.